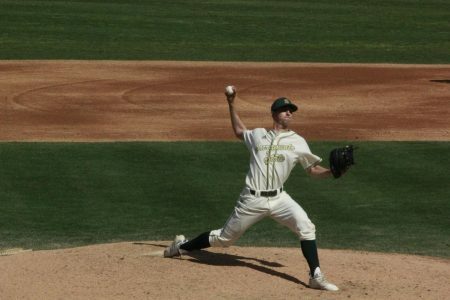 Sac State junior right-handed pitcher Austin Roberts throws a pitch in a 6-0 win over Cal Tuesday at John Smith Field. Roberts started and got the win despite only pitching two innings in the victory. 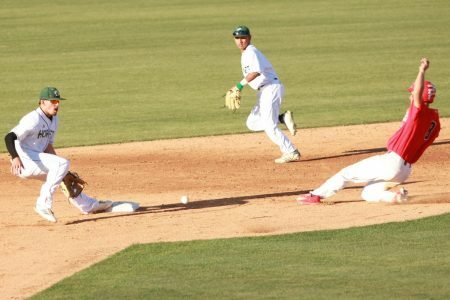 The Sacramento State baseball team closed out a season-long 13 game homestand Tuesday with a matchup against the University of California, Berkeley Golden Bears. 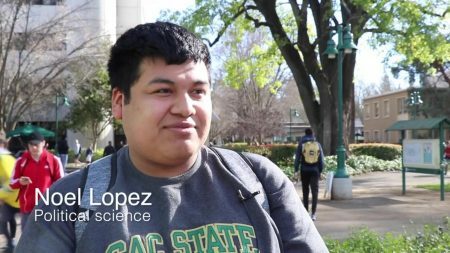 The Hornets (16-8, 2-1 WAC) and Golden Bears (11-11, 2-4 PAC 12) played once last season, and Sac State got a victory on the road in Berkeley, 4-1. 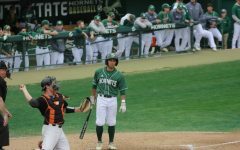 Sac State came into Tuesday’s contest seeking redemption, following a loss to the University of Texas Rio Grande Valley Sunday by a score of 5-3, ending the Hornets 11 game win streak. 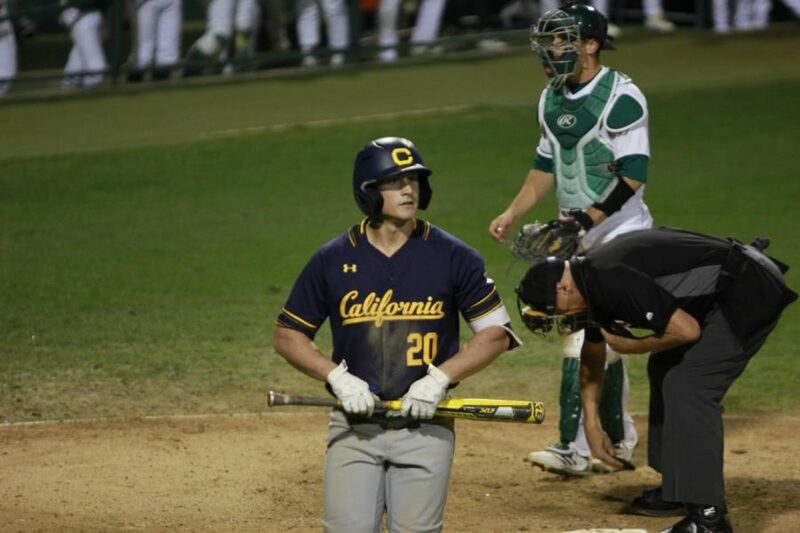 Cal came out strong in the first inning looking to score first, but starting right-handed pitcher Austin Roberts was able to stop the Golden Bears from scoring by not allowing a run. 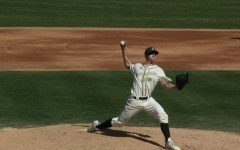 Due to the match being a midweek game, Sac State head coach Reggie Christiansen elected to go with a rotation of pitchers since the team does not have a set fourth pitching starter for midweek contests. Roberts pitched the first two innings, allowing one hit and one walk with two strikeouts. Cal junior infielder Andrew Vaughn walks away from home plate after striking out in a 6-0 loss to Sac State Tuesday at John Smith Field. Vaughn, a highly touted MLB prospect, went 0-4 with three strikeouts. 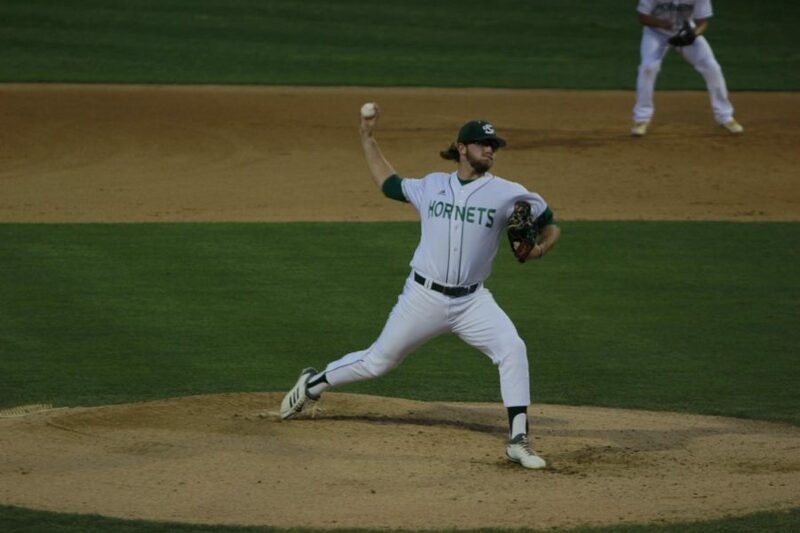 Sac State brought out six more pitchers for the final seven innings as they shut out Cal. 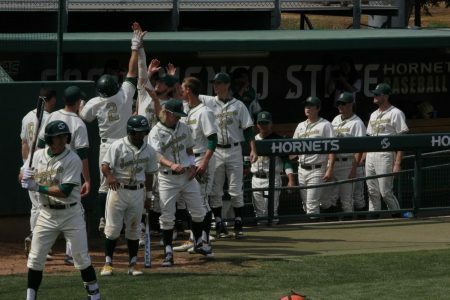 The seven Hornet pitchers combined to allow only four hits and three walks while striking out 13 Golden Bears. 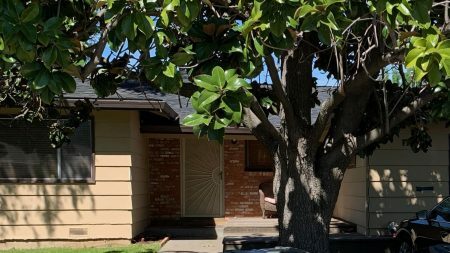 Cal junior infielder Andrew Vaughn, one of the top collegiate MLB draft prospects in the country, was held in check Tuesday by the Hornets, going 0-4 with three strikeouts. 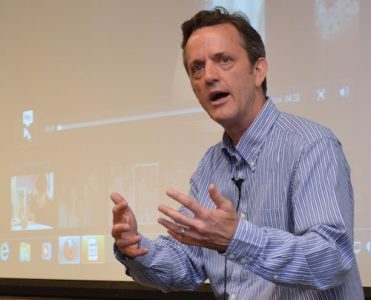 Coming into Tuesday’s game, Vaughn had a .365 batting average with eight home runs and 24 RBIs on the young season. “[Cal is] extremely physical [and] one of the best offenses on the West Coast,” Christiansen said. 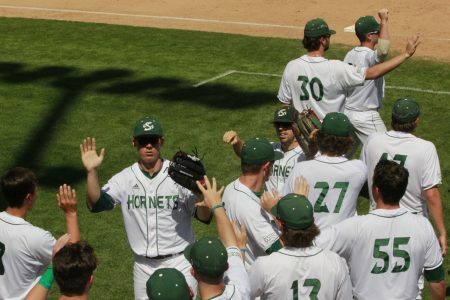 The Hornets got on the scoreboard first with two runs in the bottom of the second inning. Cal freshman right-handed pitcher Mitchell Scott had four walks in the inning and walked home two Hornets for the first runs of the game. 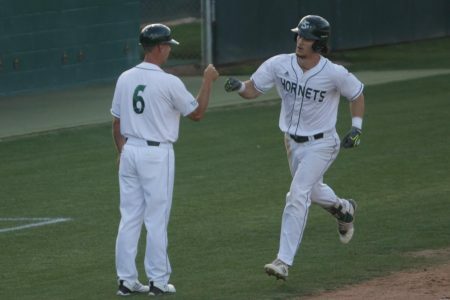 Junior outfielder Matt Smith and junior infielder Ryan Walstad walked home to give Sac State the lead. Walstad had a productive game Tuesday as he hit 4-4 with one run and one RBI. 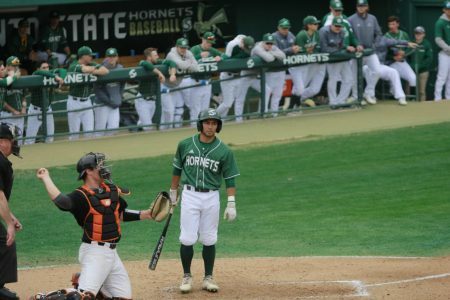 The Hornets doubled their lead in the bottom of the third inning with an RBI from Walstad and a fielder’s choice RBI from Sac State sophomore infielder Keith Torres. 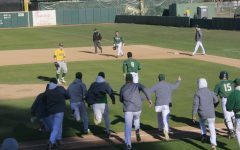 Sac State put the win out of reach for Cal in the bottom of the seventh inning, scoring two more runs. 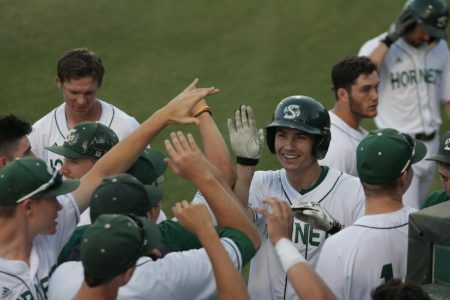 Sophomore infielder Steven Moretto hit a solo home run to left field. 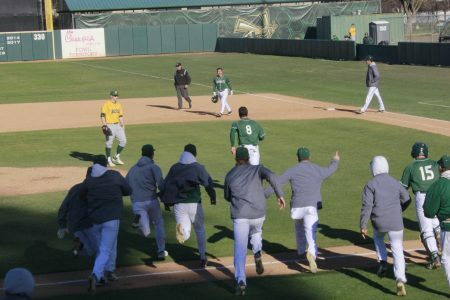 The final run was unearned as the Golden Bears made a fielding error, followed by a single from Torres to bring in the sixth run of the game. Hornets get another run, this time on a single from sophomore INF Keith Torres. Freshman INF Aaron Zeidman scores from second base after coming in to pinch-run for junior INF Ryan Walstad. The Hornets finished the season-long 13 game homestand with a 12-1 record. 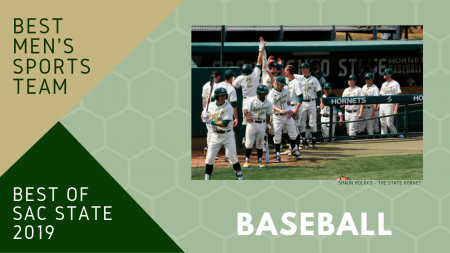 Sac State now goes on the road for the first time in over three weeks, playing their first road Western Athletic Conference series of the season against the California Baptist Lancers (17-8, 2-1 WAC). 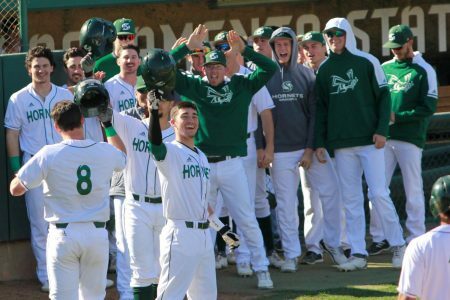 The Hornets plays the Lancers in a three-game weekend series. First pitch Friday is scheduled for 5 p.m.